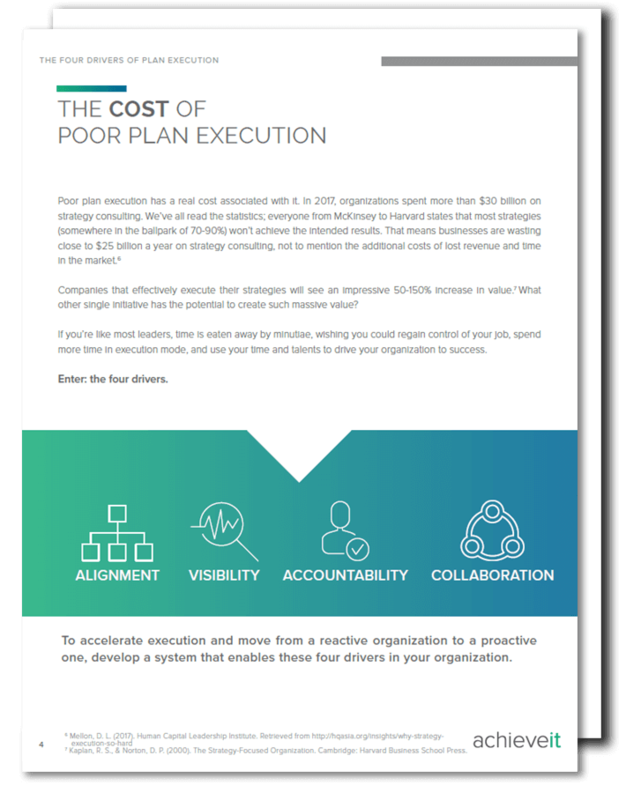 Download "The Four Drivers of Strategy Execution" to build the foundation for execution excellence. As a strategy professional, you’ve developed your own system for checking off all the boxes along the strategy creation path. But if your organization is like most, strategy execution continues to be an uphill battle. This struggle has been well-documented; according to Harvard Business Review, 75% of organizations struggle to implement strategy, and according to The Economist, only 2% of leaders are confident that they’ll achieve 80-100% of their strategy’s objectives. It’s painful to realize that most organizations will fall short of their goals. However, you have the opportunity to set yourself apart and lead your organization to success. To become part of this empowered group, you need to engage the four drivers of strategy execution.